The right to buy council houses in parts of the Highlands has been suspended to protect affordable stock. The Scottish Executive has agreed to the local council's five-year move to ease pressure on the market. The suspension will cover properties in Inverness, Badenoch and Strathspey, Nairn, Skye and Lochalsh, with parts of Lochaber and Cromarty also affected. Communities Minister Malcolm Chisholm said the council presented a "convincing" case for the move. The executive estimates that the ban will cover about 2,000 tenants and halt the potential sale of 570 properties. Council tenants whose tenancy began before September 2002 will still be able to buy their homes, as will those living outside the areas covered by the ban. 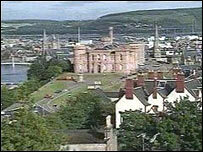 East Renfrewshire was the first council in Scotland to be given permission to ban council house sales. The policy was introduced in the 1980s under Margaret Thatcher's Tory Government. Mr Chisholm said: "Highland Council presented a convincing case in support of their application. "There is compelling evidence of substantial pressures on affordable housing in the areas the council identified." The minister stressed the move did not mean any change in the right-to-buy policy. "The executive recognises that there are strong views about right-to-buy but we will consider the case for further change only when we have seen the evidence that will be collected on the effect of the policy and reported to parliament next year," he added. Margaret Davidson, Highland Council's housing convener, said the move was driven by a severe shortage of affordable housing in many areas. She said not enough housing association rented homes were being built to replace council housing sold through right-to-buy. "Communities have consistently told us that tackling this shortage should be one of our highest priorities," Ms Davidson went on. "We are working hard with our housing partners to build new affordable homes across the Highlands but the challenge is enormous so I welcome this decision by the Scottish Executive." Shelter Scotland welcomed the council's move and questioned the merits of the right-to-buy-policy. Spokesman Gavin Corbett said: "Shelter carried out research over the summer which showed that 82% of councillors in Scotland wanted to see a major overhaul of the right-to-buy policy, so the move by Highland Council is not surprising. "The right-to-buy policy in Scotland continues to drain housing stock of about 11,000 homes a year, with over 440,000 lost in the 25 years since it was introduced."